Know your recycling volume today, but also forecast ahead to account for fluctuations in volume, for example, from events, changes in the total quantity of people in a building etc. Size your recycling receptacles and bins to accommodate your maximum expected volume periods. Do you need a 12” diameter receptacle? 15”? 20”? Other? Whether it is near vending machines, in high traffic areas or in a lobby, every building has “hot spots” where recycling receptacles are most in demand. Plan out your space to ensure that you have enough frequency of recycling stations to meet expected traffic levels. 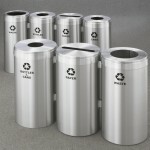 Ideally recycling receptacles will fit the overall décor of their space and look great in context. In our opinion, they should enhance and add to a building’s aesthetics. Find the right style combined with the finishing options and colors that will fit seamlessly into designated areas. Quality products last longer and they are more reliable. If you are thinking long run, you will also save the planet resources by investing in recycling bins that you may never need to replace. Modular recycling stations allow a building owner or facilities manager to take two or more recycling containers and connect them to each other in any sequence they would like. They can be connected in a straight line or in triangular a configuration. Connected units keep the recycling receptacles together for a neat and organized appearance. For many, having the flexibility to arrange recycling receptacles into professional recycling stations is an important option to consider. Fire safety is important in all aspects of a building. Consider using metal recycling receptacles that have fire safe construction rather than cheaper, plastic bins that are unable to meet the same safety standards. Tasteful signage, stenciling on the recycling containers and communication of the importance of recycling through other methods in a building are all important to encourage use. In combination with placing them in strategic areas, you can maximize their use. What thoughts do you have that could benefit others looking to implement a successful recycling program in their building? Share your ideas and help us develop this list further.